Every time I walk into my favorite arcade, it seems as if the operator has just installed two or three new video games. I barely have a chance to become mildly addicted to one machine, and suddenly I'm tempted to play these flashy new games. I wish game manufacturers would slow down their production, it's making it really difficult for me to choose a favorite coin-op game. This article contains descriptions, supplied by the manufacturers, of the most promising new games for 1983. Cinematronics has announced a new raster scan game, Jack the Giantkiller. This game offers "exciting, fast-paced action" with full color graphics and a full complement of sounds and music. Jack the Giantkiller is said to be filled with new surprises that continue to challenge players. Difficulty levels are marked by the number and types of adversaries faced by the player as the game progresses. Enthusiastic players help Jack in his perilous journey up the beanstalk to retrieve treasures and rescue the princess from the giant's castle. Travel up and down the beanstalk is fraught with obstacles that add to the challenges of the game. The dangers of climbing the treacherous stalk are magnified by the various creatures that attack Jack to keep him from reaching the top. Rewards for completing each phase of the climb include both scoring opportunities and special animated cartoons. The action is enhanced by the continuous introduction of new elements to the game play. Twelve different levels of difficulty are included to challenge the player and maintain interest. There are five different scenes of action that Jack encounters in his journey to retrieve the treasures. Each scene offers a different type of action. Scene 1--JACK CLIMBS THE BEANSTALK from his cottage through the thick mazes of leaves. Jack can pick beans and use them as ammunition against various attackers. Scene 2--JACK ENTERS THE CLOUDS and carefully makes his way to the castle without falling. Lions and attacking birds must be avoided by jumping over them or throwing beans at them. Jack must cross the lowered drawbridge to enter the castle. Scene 3--JACK CLIMBS THE CASTLE STAIRWAY leading to the giant's room. There are missing stones and falling steps that Jack must avoid as he runs and leaps up the stairs. Scene 4--JACK ENTERS THE GIANT'S ROOM and climbs platforms and stairs to reach the top of the table where the treasures are. Three treasures and the princess are waiting to be retrieved. After getting the item that is flashing, Jack must return home safely. Scene 5--JACK CLIMBS DOWN THE BEANSTALK with his treasure, and tries to reach his cottage safely. After rescuing the princess, Jack chops down the beanstalk. He then begins his adventures again at a higher difficulty level. For the first time, Cinematronics is offering 3"x5" player tip cards that give hints on how to play Jack the Giantkiller. To obtain these cards, ask your local game room operator to contact Cinematronics. Williams has introduced their latest in-house designed and developed video creation, Joust. 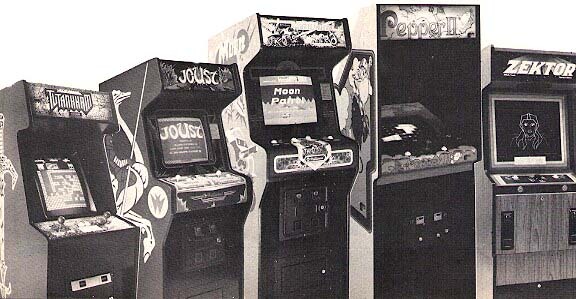 Williams' dual-player Joust offers arcaders the opportunity to challenge each other in direct, head-to-head competition or to team up against a common enemy--the game itself. One person can play alone, but, when two play, the game becomes even more intriguing, increasing the possibility of reaching higher waves and taking on new challenges. Players start their journey into the mythological world of fantasy and fun mounted on an ostrich or a stork. Each player, manning a "flap button" and a joystick, flies his bird toward enemy riders astride buzzards and attempts to unseat them. A successful Joust scores points for the player and turns the enemy into a egg that must be picked up before it hatches into an even more dangerous adversary. Later in the wave, players must beware of a deadly pterodactyl which emerges, swooping down to keep the players jousting until all of the enemy are defeated. As play progresses, fire consumes the bridge on both sides of the bottom ledge leaving smaller and smaller areas in which to land, and a "lava troll" takes shape, reaching its deadly grip up to grab anything that dares to fly over er its den. To make the play even more interesting, the second wave and every fifth wave thereafter are Survival Waves. Players are rewarded with 3000 points for not losing any riders during these waves. Every fifth wave is an Egg Wave in which players earn extra points by picking up as many of a dozen eggs as possible before they hatch. In dual-player action, players move into more sophisticated and intriguing waves and have more strategy decisions to make, such as whether to play together against the enemy riders or to play against one another. Wave two and every fifth wave thereafter become Team Waves with 3000 points (adjustable) awarded to both players for teaming up and not unseating one another. The exact opposite holds true for wave four and every fifth wave thereafter. These are Gladiator Waves. Here the bonus points are used to encourage the players to Joust against each other and are awarded to the first player who is successful. To add realism to the intense challenge and competition, Joust also features outstanding graphics, animation, and sound effects in a crisp clear colorful package. Williams has also introduced the intriguing new video offering, Moon Patrol. According to Williams, "the striking realism and perspective of the screen graphics set the background for the multiple challenges players will face as they attempt to patrol uncharted terrains of the moon." Moon Patrolers must race to beat the clock as they maneuver tanks from checkpoint to checkpoint. Beating the average time earns big bonus points and scoring points along the route entitles the player to another tank. Tankers must use all of the controls at their disposal to maneuver the tricky tanks. A joystick accelerates the tank from slow to medium to fast forward. A jump button causes the player to leap over the ground level traps, and a trigger button simultaneously fires missiles straight up at the invading UFOs and straight a head to disintegrate obstacles in the path. On the Beginner's Course, the patroler must contend with mammoth boulders that must be either blasted apart or leapt over. Almost immediately, space ships, flying saucers, and UFOs appear on the scene dropping missiles and bombs. The player faces territories studded with land mines and alien ground force tanks shooting cannons dead ahead. If the player can handle all this action and make it to the end of the Beginner's Course, he progresses to a more difficult route--the Champion Course. In this segment of his patrol, wilder and more exotic confrontations await him. He must beware of fast rolling rocks skidding along the terrain at an incredibly fast pace, not to mention volcanoes about to erupt. He will also meet low flying alien planes that sneak up behind his tank. Each new section of the moon that is conquered is a challenge. If a player loses all of his tanks, he has the option of proceeding from where he left off or starting back at the beginning of the course if he wants to play again. Exidy has announced the release of its newest game, Pepper II. Pepper II is a colorful secret maze game, in which the player controls Pepper, a character who is usually an angel, but at times assumes a devilish guise. Pepper explores four sides of a cube for hidden areas, leaving tracks resembling a zipper as he goes. Once he has surrounded an area with tracks, a colorful pattern fills it in and points are awarded. During his voyage, Pepper must avoid Roaming eyes as well as the Whippersnapper, a bright crimson enemy who "unzips" any of Pepper's tracks that have not fully enclosed an area when he strikes. When Pepper encloses an area containing a pitchfork, he turns into a devil for a few seconds. In that condition, he can capture the Roaming Eyes for points. The Whippersnapper, however, remains a deadly threat. The catchy tune and exciting game play of Pepper II are designed to appeal to players of all ages. 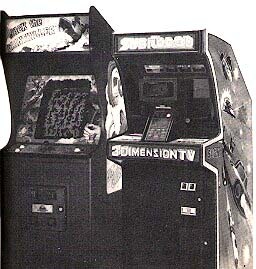 Subroc-3D, a new video game from Sega/Gremlin, brings authentic three-dimensional video and stereo sound effects to the arcade. Using a revolutionary optical viewscope and dynamic stereo sound techniques, Subroc-3D provides players with unprecedented sight and sound realism in a futuristic air and sea battle adventure. The action takes the player through day, dusk, night, and dawn sequences in an array of 3-D graphic and color changes. The object of the game is to score points by defeating a barrage of enemy warships on the sea and in the air and to destroy the elusive, barrier-protected Command Ship at the end of each round. Each succeeding round increases game action with more and faster adversaries and firepower, providing new mystery ships and points to heighten player interest and excitement. The three-dimensional effects are produced with sophisticated new hardware and software systems. The playfield is viewed through a 3-D viewing system which allows the player to see a true, three-dimensional image without 3-D eyeglasses. Dynamic stereo effects provide "surrounding" sounds of explosions, spacecraft, and sea vessels. During game play, the player can choose between air and sea battle as part of the special player-control features built into the game. At sea level, the player faces various seacraft enemies which fire torpedoes and space charges. Ominous battleships head directly toward Subroc. Other warships, called destroyers, move horizontally across the screen at varying distances from Subroc, their point values changing in proportion to their distance. Tri-Fleet Carriers launch craft, which attack Subroc with lethal fireballs that cannot be destroyed, but must be avoided. From the air, Subroc is attacked by Flying Saucers and gargantuan Airships firing lethal rockets. All the air and seacraft, their rockets and torpedoes, are targets for Subroc and when hit, score points for the player. The final challenge of each round, the amphibious Command Ship, is the ultimate test of player skill. The headquarters Command ship can submerge below the surface of the sea, propel itself on the surface or rise above the water as a huge aircraft. It also protects itself with a Force Field which must be penetrated with a precise hit from Subroc, leaving the Command Ship vulnerable. In later rounds, new targets, such as pirate ships, offer opportunities for mystery point scoring. Stern Electronics, announces production of its latest action video game, Tutankham, a one- or two-player game licensed from Konami Industry, Japan. Konami has previously licensed to Stern such favorites as Scramble and Super Cobra. Through the use of realistic graphics, Tutankham provides the player with abundant challenges through four phases, each increasing in difficulty. The object of the game is to find the treasure hidden deep in the tomb. The player advances carefully through a pyramid, avoiding or destroying enemies while trying to pick up hidden treasures and keys to new rooms in the tomb. The player enters a new, more difficult room by delivering the key to a locked door. The game uses two joysticks. The left one moves the player in four directions to pick up treasures for bonus points and to search for the key. A map at the top of the screen shows where the key and door are located. The right joystick allows the player to simultaneously operate the power beam, which is used to destroy the asps, vultures, and bats. Beware, though, the player may fire only left or right. A flash button may be used to destroy all enemies at once. Space game enthusiasts are put to a rugged new test in the latest video game from Sega/Gremlin. Zektor provides players with the action, speed, and sound effects of a movie space adventure. Zektor challenges the player to recapture eight cosmic cities that have been seized by an evil cadre of alien robots. To liberate a city, the player must defeat three attack waves of enemy fighters and Roboprobes which fire lethal Zizzers at the player's ship. Three types of Moboids can bounce, spin, or explode the player's ship. The talking male and female robots themselves can be neutralized between rounds by firing through slotted tunnels in protective, revolving barriers. The object of the game is to liberate all eight cities from alien robot occupation. The eight space cities are depicted in vivid vector graphics as are the menacing male and female robot faces. Each robot verbally challenges the player to retake its respective city. Each round is more aggressive than the one before. Extended play can be gained by defeating the city of the eighth robot. A new rotary player control is located in the center of the control panel. By rotating the knob either clockwise or counter-clockwise, the player steers his ship. Thrust and fire control buttons are located on both sides of the rotary player control for right- or left-handed players.